“In this year’s report, an overwhelming 38 percent of brands registered an Average ranking, versus just 10 percent in 2011,” says NYU Professor Scott Galloway. 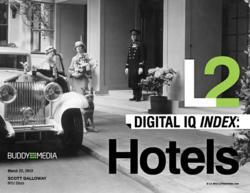 New research demonstrates a clear relationship between hotel brands’ Digital IQ and shareholder value. The ranking, developed by NYU Stern Professor Scott Galloway and a team of experts from L2, in partnership with Buddy Media, measures the digital competency of 52 hotel brands via 350 data points across four dimensions: Site, Digital Marketing, Social Media, and Mobile. Based on these scores, each brand is assigned a Digital IQ and a corresponding class of Genius, Gifted, Average, Challenged, or Feeble. L2 data reveals a positive relationship between Digital IQ and year-over-year growth in Revenue Per Available Room (RevPAR), and between Digital IQ and year-over-year change in stock price. Content demonstrates substantial ROI: sites with user reviews lost 38% less traffic to online travel agents and sites with local, curated content enjoyed 16% greater average time on-site. Larger organizations with multiple brands significantly outpaced independent hoteliers on digital platforms, registering an average Digital IQ of 109 versus 92 for independent private brands and 87 for independent publicly traded brands. Social media usage continues to soar. The percentage of brands deploying both global and property pages on Facebook rose from 73% in 2011 to 95% in 2012, and on Twitter increased from 56% to 70%. Two-thirds of brands in the study support a mobile-optimized site and mobile-booking functionality. Mobile-enabled brands may be capturing the most profitable bookings as 70% of bookings via mobile are for same day (higher price) stays. L2 is a think tank for digital innovation. Founded by NYU Stern professor of marketing Scott Galloway, L2 helps prestige brands navigate the digital marketing landscape through events, research, and advisory services. The L2 Digital IQ Index® is the largest and most robust study of its kind. Rankings are published annually across industries including: Fashion, Watches & Jewelry, Specialty Retail, Beauty, Travel, and Fragrance. For more information, visit: http://www.l2thinktank.com. Buddy Media is the social enterprise software of choice for eight of the world's top ten global advertisers, empowering them to build and maintain relationships with their consumers in a connections-based world. The Buddy Media social marketing suite helps brands build powerful connections globally with its scalable, secure architecture and data-driven customer insights from initial point of contact through point of purchase. Buddy Media is the most award-winning social enterprise software company, winning the prestigious TechCrunch “Crunchie” Award for Best Enterprise application, named to the Advertising Age 2011 "Digital A-list," and CEO and Founder Michael Lazerow was selected as 2011 New York Entrepreneur of the Year® by Ernst and Young. For more information, visit http://www.buddymedia.com.